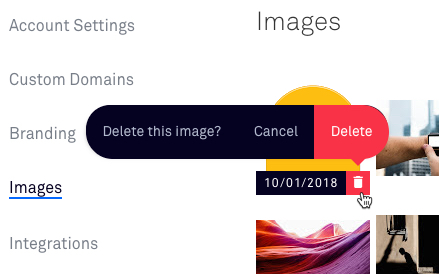 Besides using the image widget within the Leadpages builder to add and remove images from pages and pop-ups, there's an Images library in the dashboard of your account. Click the profile icon at the top right corner of your dashboard. Choose the image file you would like to upload from your computer and click Open. Press the trash can icon for the picture you want removed.